← Glasgow – A City of Culture (sometimes;))! The Royal Family Dine Out in The Caprese! Here we are at the end of another week and what a busy week it has been in the Caprese. 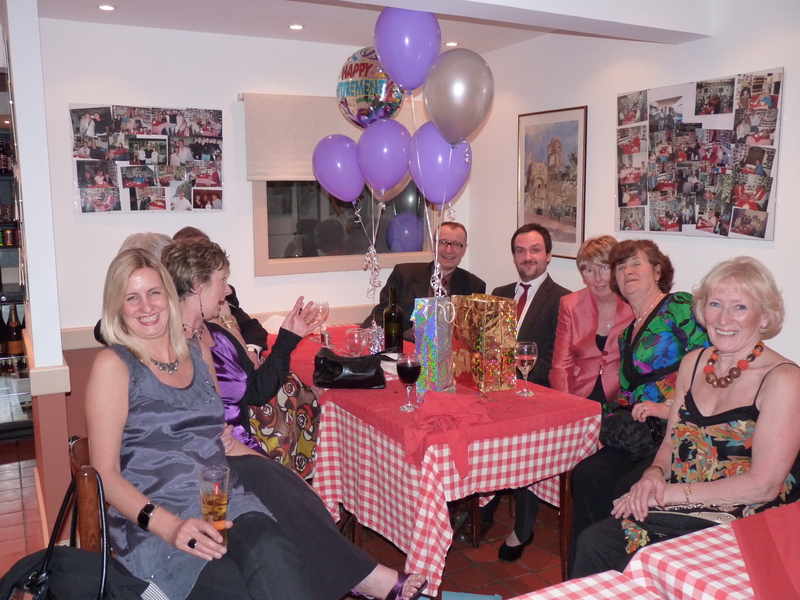 Last night we played host to the lovely ladies and gentlemen from Glasgow Royal Infirmary who came to celebrate the retirement of one of their staff (Liz) from their Theatre Department. We love when all of these medical people are around because it gives us a chance to dig out all of our old ailments and have a quick diagnosis without having to leave the restaurant! Last night though we allowed them to have their night out in peace to enjoy the food and wine but rest assured we’ll have some illnesses ready for your next visit! A big thank you to Marie who organised the event and we hope that you all enjoyed yourselves. As you can see from the photographs, they decorated each table with helium filled balloons and scattered confetti everywhere (which we will no doubt still be finding this time next year!) so we were looking lovely and festive for the party. Their menu included some delicious Spaghetti with Meatballs which Costanzo had made especially for them so we hope that they were enjoyed by everyone that had them. At the end of the evening, a nice cold glass of Prosecco was in order before they headed off in their taxis home. Hope to see you all again soon and have a happy retirement Liz! During the week we were visited by our friends with friends in high places, ie our lovely group of priests that come in regularly for lunch. We laughed the entire afternoon at their off the cuff remarks. Unfortunately we cannot divulge the conversations as we have taken a vow of silence but suffice to say if there were more priests like that in church then it would make going to mass a more enjoyable experience! We have another busy night ahead of us tonight with it being a Saturday. We expect that there will be a lot of people coming into Glasgow this evening since it is the May Bank Holiday weekend and everyone seems to go out to celebrate the fact that they have an extra day off from work! We are no exception and will be closed this coming Monday 3rd May for a nice rest, some good food and will perhaps partake in a few glasses of wine just to be sociable of course ;). Back to business as usual on Tuesday so hope to see some of you soon! Have a lovely May bank holiday everyone and let’s hope that the weather warms up in our part of the world by tomorrow because it is positively wintery at the moment!